Finance Minister Bill Morneau speaks to reporters after a meeting with provincial and territorial finance ministers in Ottawa, on June 26, 2018. Ottawa is facing pressure to speed up its promised response to U.S. tax cuts as businesses deal with the higher costs of an escalating trade war. Business groups say the government’s continuing talks about improving competitiveness must soon turn to action – whether in a possible Throne Speech or a fall fiscal update – in light of the added strain of a cross-border trade battle. But some of the most common policy recommendations for making Canada a more attractive place to do business are running up against core Liberal campaign promises. For instance, Canada’s higher top personal tax rates are frequently cited as a challenge for companies competing with U.S.-based firms to entice top talent. Yet, the Liberal government’s core campaign pledge – which it is highly unlikely to reverse – was to raise taxes on the top 1 per cent. Similarly, calls for corporate tax cuts lead to discussions over how to pay for them. Big business advocates say a lower corporate tax rate could be funded by raising the currently much lower rates for small businesses, but Ottawa has already promised to cut small-business taxes next year. The U.S. tax cuts are being financed in part by growing annual deficits, yet Ottawa is already posting larger deficits than promised and would be criticized for going even deeper into the red. “They’ve kind of boxed themselves in,” said former Bank of Canada governor David Dodge, who recently co-authored a report for the Bennett Jones law firm outlining how Canada should respond. “They can’t have their cake and eat it, too. And on the competitiveness side, they have a terribly disjointed policy,” he said. 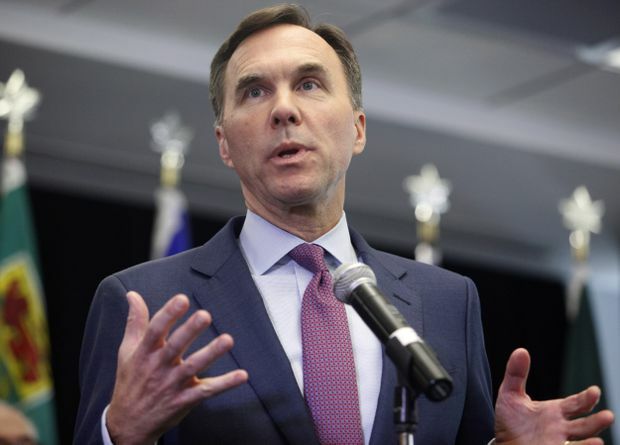 At the time of his February budget, Finance Minister Bill Morneau said he and his department would take a close look at the sweeping and complex U.S. tax changes that had been adopted the previous month before announcing how Canada might respond. In May, the minister said he would continue this review through the summer and into the fall. The minister’s comments to date suggest he is unlikely to support a large corporate tax cut, but may be open to matching other parts of the U.S. tax package, such as incentives for companies to invest in their business. A spokesperson for the minister said the competitiveness file remains one of Mr. Morneau’s top priorities and that talks with the business community about policy options will continue throughout the summer. But business leaders are becoming impatient in light of the U.S. government’s decision to impose tariffs on steel and aluminium imports in late May and Canada’s decision to respond on July 1 with retaliatory measures. The Tax Cuts and Jobs Act that took effect on Jan. 1 in the United States has many components, but there are two main changes that affect Canadian competitiveness. The first is a permanent cut to the federal corporate tax rate from 35 per cent to 21 per cent. When combined with state and provincial corporate taxes, the United States now offers slightly more competitive tax rates. The combined U.S. rate is 25.84 per cent, compared with 26.8 per cent in Canada, according to the Organization for Economic Co-operation and Development. The second key change is temporary tax breaks on business investment, such as purchases of new equipment. A report prepared by the CME based on a survey of manufacturers recommends responses on both fronts. The report calls on Ottawa and the provinces to reduce the combined corporate tax rate to 20 per cent and to give businesses a 100-per-cent tax write-off on capital asset purchases. New Ontario Premier Doug Ford was elected on a platform to reduce the province’s corporate tax rate to 10.5 per cent from 11.5 per cent. Mr. Ford will have his first chance to meet all of the other premiers later this month when the Council of the Federation gathers in New Brunswick. Canada’s economic relationship with the United States is likely to be a key topic of discussion. Quebec Finance Minister Carlos Leitao recently indicated that he’s cool to the idea that corporate tax cuts are the best response to current economic challenges. The Quebec government is promising to release a package of measures soon that aim to boost the province’s productivity and competitiveness. Mr. Morneau, the federal Finance Minister, has repeatedly said this year that in spite of the U.S. tax cuts, Canada remains competitive with the United States from a business perspective. He has also said that competitiveness is about more than just tax rates, pointing to issues such as infrastructure, a skilled labour force and immigration policies. Perrin Beatty, president and CEO of the Canadian Chamber of Commerce, agrees that action on competitiveness should not worsen the fiscal challenges faced by Ottawa and many provinces. That’s why he is urging governments to focus on incentives for new equipment purchases and streamlined regulations. Kinder Morgan’s decision to walk away from the Trans Mountain pipeline project is frequently mentioned by business leaders as an example of how Canada’s slow project approval process is hurting foreign investment. Mr. Beatty argues that an affordable and targeted package of measures focused on easing regulation and encouraging new investment is possible and required.